Switching to chemical-free, organic lawn care is easy. Here’s how. This is for the person who thinks organic is all very well if it works, but who isn’t interested in losing ground (or grass) while making the transition or testing the waters. Going organic can also seem like an awful lot of work. This page, then, suggests things you can do easily that move you in an organic direction. Scan the list and do first whichever seems most doable. Going full-bore organic isn’t your only choice if you want to avoid exposing yourself, your pets, your family, and the environment to toxic chemicals. Anyone interested in organic lawn care but leery for any reason — what if it doesn’t work, what if I get in over my head, anything — should also know about Integrated Pest Management. IPM, a well-recognized and growing approach to lawns, gardening, and agriculture, is like organic gardening with a loophole: you do everything to establish a healthy crop on healthy soil using earth-friendly methods, but if you hit a problem you can’t solve, you take recourse to chemicals. Synthetic fertilizers and pesticides therefore become the last resort, rather than the first. You may still use them from time to time, but you’ll use them far less often and only after trying other methods. 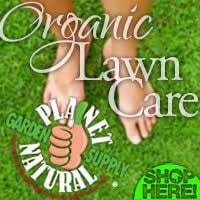 With the right lawn care products​ ​going organic is easy! Planet Natural has everything you need to guarantee the healthiest outdoor environment possible. Need help? Our Landscaping Blog provides the ideas, information and practical experience you need to get the job done right. Switch to an Organic Fertilizer. This is one of the easiest things you can do, especially if you’re not using a lawn service. There are numerous organic options, including pellets or powders that can be applied with a spreader in the same way that most commercial fertilizers are usually spread. See Fertilizing for details. Set your Mower Height High. Set your cutting height to 2.5 to 3 inches, and cut long. The longer grass will shade out more weeds than will short grass, it will protect the dirt from evaporation, and it will grow more slowly than short grass. Longer lawns therefore need fewer pesticides, less water, and less frequent mowing than short lawns. Unlike the clunky contraption your grandpa used, modern push reel mowers are lightweight and easy to maneuver. Quieter and cleaner than their gas-powered cousins, they are actually better for your lawn than a power rotary mower which can tear and damage grass ends. Let Grass Clippings Lie. Don’t rake up the grass cuttings after you mow. The cuttings help shade out weeds in spring, help slow evaporation (promoting water conservation) in summer, and provide important organic material for your soil all season. This practice works best if you mow frequently, so that the clippings are relatively short. Long clippings may lie about on the grass like a bunch of hay, looking unsightly and doing little to enrich the soil. Shorter clippings will sift down between grass blades more easily than long ones, gracefully removing themselves from sight and beginning to decompose relatively quickly. They thus satisfy both aesthetic and environmental standards. Read our article on Grasscycling to learn more. NOTE: If you’ve been giving your lawn heavy doses of chemical fertilizer, you may not want to make this your first step into organic territory. Too much synthetic fertilizer can kill soil microorganisms, thus damaging the soil’s ability to break down organic matter, so those grass clippings could hang around much longer than you want them to. If you’re in any doubt, switch to an organic fertilizer first, and then let the clippings lie. Sharpen Mower Blades. Fungi, viruses, and pests all flourish in unhealthy grass, and many such pathogens enter grass blades through damaged spots. Dull mower blades mangle grass, leaving it bruised and torn. The open spots make the grass vulnerable to disease and other problems, and the mangling makes it less healthy overall. Sharp mower blades cut grass cleanly, avoiding bruises and leaving only a minimal cut open to bacteria. Your grass will therefore be healthier and will need less by way of pesticides and fertilizer. Click on how to sharpen lawn mower blades, and your grass blades will benefit. Water Early in the Morning. Plants cannot make efficient use of water in the heat of the day, because their pores close to minimize transpiration, the loss of water from their leaves. In dry climates or dry conditions, up to 50% of sprinkler water can evaporate. For both these reasons, it is best to water in the morning before the day heats up. Your water bill will be lower, since less water will be wasted, and your grass will benefit, since it will receive water at the optimal time of day. 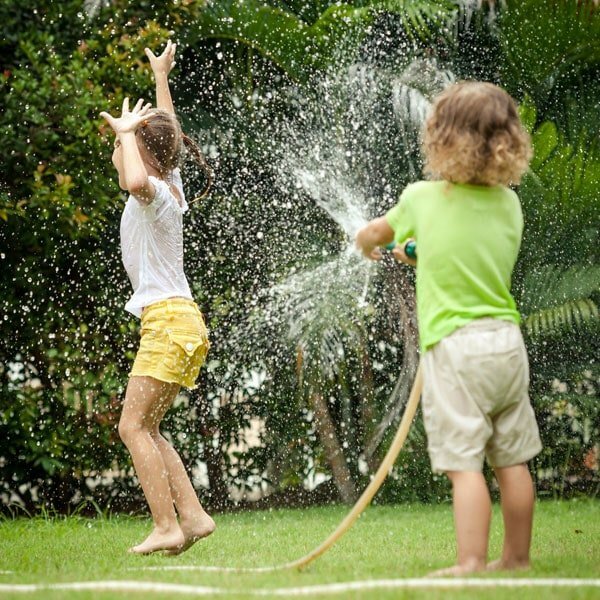 See our article, Save Water On Your Lawn, for more water-saving tips that can help save you money. Delivers NINE patterns of water with a quick-click of the dial. 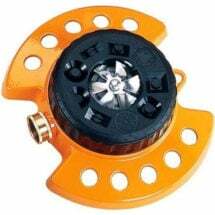 The ColorStorm Turret Sprinkler by Dramm provides an incredible amount of flexibility when watering the lawn. Available in FIVE vibrant colors and includes a heavy-duty metal base for increased stability. Water Deep — NOT Often. Plants will work only as hard as they need to; roots will grow only as deep as they must. Frequent lawn watering, even if it’s deep, encourages grass roots to stay shallow, which in turn means that they cannot reach deeper water during drought conditions. Less frequent watering forces roots to grow deep in order to reach deeper water. The problem with infrequent watering is that dry soil (like a dry sponge) does not absorb liquid readily. Instead, the water tends to run off the surface or percolate down cracks to deeper levels without soaking into the topsoil. The solution is to water twice, once briefly, and then again more thoroughly after an hour’s delay. Ideally, the first watering would deposit no more than a half inch of water, while the second would deposit a full inch. The overall goal is to saturate the earth to a depth of six to nine inches. The first, brief watering gives the surface a chance to expand and absorb the water, so that the next, more lengthy watering will actually soak into the soil, saturating it evenly rather than just running off or trickling through it via a few routes to depths below those where grass can reach it. Topdress with Compost. To topdress is to sprinkle fertilizer or a soil amendment on top of the soil rather than to dig it in. Summer top-dressing with compost should be light — a quarter of an inch at a time — but this will improve the soil in a number of ways. Organic care depends on good soil, so topdressing helps ensure that your soil is able to sustain a thick growth of healthy grass. The easiest way to start the move towards organic lawn care is to make sure your lawn is really healthy. All of the regular seasonal lawn maintenance chores are therefore excellent ways to go. Those chores are summarized here. Remove Thatch. Thatch is that layer of stems, roots and dead organic matter you can see when you part grass stems. A thick layer of thatch suggests overuse of synthetic pesticides or fertilizers, since these tend to kill off the micro-organisms that help organic matter to decompose. Thatch only becomes a real problem when the layer is thicker than a half inch, at which point it can become a breeding ground for insects and for various fungi, and a barrier in the way of water absorption. If you scroll through a page on fighting lawn problems, again and again you will see advice to remove excess thatch. Clippings often get blamed for thatch, and people rake clippings because they don’t want to contribute to thatch build-up, but this is a false problem with a non-solution. Clippings only contribute to thatch if they are excessively long or if the thatch layer is so deep that it keeps clippings from decomposing. Even a thin layer of thatch should be broken up or removed every couple of years, to prevent it from building up past that point. For everyday thatch of less than half an inch in depth, use a garden rake or a tool designed for removing the matted material. Top-dressing (adding a thin layer of something on top, rather than digging it in) with soil or compost can also be helpful, as both these materials contain microorganisms that will help the thatch to decay. For regular seasonal maintenance, these are all that should be necessary, and on many lawns they may only be necessary once a year or even less. Just check the thatch level each spring and fall. For more serious thatch buildup, you may need to rent a vertical mower, a specialized machine that works vertically to break up and remove buildup. Unfortunately, a vertical mower can be so hard on the rest of your lawn that you’ll often need to reseed after using one. Anything that hard on the lawn should only be used in spring or fall, when grass recovers more quickly than it can in the heat and stress of summer. Spring and fall are also the best times for overseeding, of course. Aerate. Aerating removes plugs of soil, which helps reduce soil compaction, one of the most frequent problems of older North American lawns. It also opens the soil to fertilizer, amendments, and seeds, so it is an excellent preparation for other seasonal care. 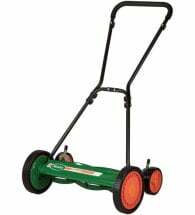 You can buy a home lawn aerator tool, rent a bigger, mechanized version, or hire out the job. It’s important to cover the lawn several times in more than one direction, so that it gets thoroughly and evenly aerated. Amend Soil. Soil amendments actually improve the soil’s ability to supply nutrients, water, and air to plant roots. The movement or availability of these three essentials can be inhibited by compaction, high clay or sand content, and high or low pH. All of these are soil conditions independent of nutritional content, but they have a direct bearing on whether nutrients can be taken up by a plant. Many amendments do supply nutrients, but their primary purpose is to improve soil texture and structure. Spring and fall are the ideal times to apply soil amendments, but lighter doses can be put on even in mid-summer. 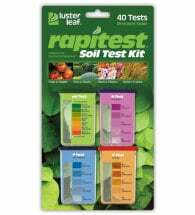 Before you start adding lime or sulfur, however, test your soil (or have it done) so you’re sure to be adding the right thing. If you’re looking for the fastest ticket to a perfect lawn, start at ground level. Planet Natural offers a large selection of amendments, turf builders, soil inoculants and testing kits to help you produce a healthy, productive yard year after year. Let’s grow together! Here’s a quick and dirty overview of amendments. The knock-down drag-out version is under our Guide to Growing a Healthy Lawn. Compost: If you’re not sure what your problem is, add compost. For that matter, even if you are sure, add organic compost. Compost is the miracle amendment, for it improves all soils. It helps balance pH, making acidic soils more alkaline and alkaline ones more acidic. It improves soil retention in sandy soils and drainage in clay soils. Used regularly, it helps reduce compaction. It contains microorganisms which help organic matter decay, keeping thatch under control and ensuring that clippings will in fact disappear, and not lie around in an unsightly fashion. For Sandy Soils: Organic additions work best to improve drainage and relieve compaction in sandy soils, because organic matter derived from plants and animals holds many times its own weight in water. Compost adds much more than organic matter, being rich in nutrients and micro-organisms, but for sheer unadulterated water retention, peat and sphagnum moss or coconut fiber cannot be beat. Mature, composted manures — not fresh manure! — are also excellent. For Clay Soils: Surprisingly, everything said about sandy soils goes for heavy clay soils as well: organic additions will make the greatest difference. Sand and gypsum are frequently suggested as amendments for clay soils, but many experts question their effectiveness, and they need to be used carefully. (For more on these debates, see Soil Amendments on this site.) With products derived from plants and animals, you cannot go wrong. 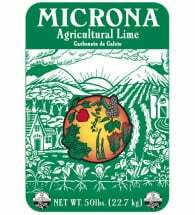 To Raise pH (make acidic soils more alkaline): Add Microna® Agricultural Lime, which is available in a number of forms. For lime to be effective, two requirements must be met: it must be dampened; and it must be in direct contact with the soil. The necessary chemical reactions cannot take place without water, and because lime is not especially water-soluble, it will not be carried by water into the soil. Pelletized lime is the easiest to handle and to apply, but not the cheapest, as it is a refinement of one of the simplest mined forms. Those forms are calcitic lime, which will also add calcium, and dolomitic lime, which will provide both calcium and magnesium. Both are sold as very fine powders, like all lime save the pelletized. Other forms of lime — marl, hydrated lime (slaked lime) and burned lime (quick lime) are not good options for lawns: the first contains various impurities, while the others are so highly concentrated that they can be dangerous to handle and will burn established lawns. 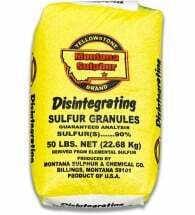 To lower pH (make alkaline soils more acidic) Add split pea sulfur, which, like lime, comes in several forms. For ground rock sulfur, add 1.2 ounces per square yard to sandy soils, and 3.6 ounces per square yard for any other soil. A number of organic (plant-derived) products will also lower pH, among them peat moss, cottonseed meal, and even animal manures, but none of these works as effectively as sulfur. Fertilize. Spring and fall are the ideal times for fertilizing, especially in the north. Summer fertilizing is less of an issue in the south, where warm-season grasses that continue growing all summer are the norm, but in the north, most lawns have cool season grasses that go dormant during hot weather. Over-stimulating them during this phase just leads to problems, so go lightly. 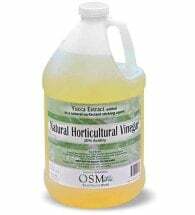 For quick results, use fish emulsion, a quick-release, organic, nitrogen-rich fertilizer that can be sprayed or sprinkled. DON’T APPLY FERTILIZER AT MID DAY, and DON’T USE MORE THAN IS RECOMMENDED, especially in hot, sunny weather; that “cure” will definitely be worse than the disease, as nitrogen + sun = burned grass. 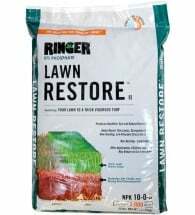 Quick-release fertilizers don’t last long, so give your grass another dose a couple of weeks later. It’s SAFE to play on! 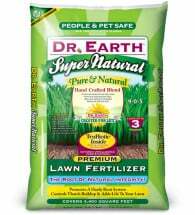 Dr. Earth® Lawn Fertilizer (9-3-5) promotes a hardy root system and controls thatch buildup. 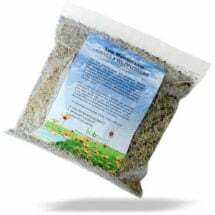 Best of all, it contains beneficial fungi to ensure that nutrients are made available to the grass roots, even under high stress conditions. Each 40 lb bag covers 4,400 square feet and last up to 3 months. For summer-long results, use a slow-release fertilizer such as organic cottonseed meal, corn gluten or blood meal in autumn and again the following spring. See our page on Fertilizer Facts to learn more. 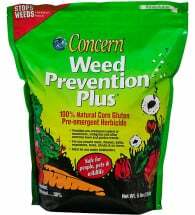 WARNING: Don’t use corn meal within several months of reseeding your grass, as it also kills seeds. Overseed. This term refers to seeding over an existing lawn. It’s a great way either to fill in bare spots or to gradually change your grass type. If you’ve got a standard-issue lawn, chances are the grass itself is not one best-suited to the region where you live, which makes all lawn care a challenge, organic or not. Overseeding lets you add a better-suited grass to your lawn without requiring that you start over from scratch. Mow your grass as short as your mower will let you. This will give the seeds better access to the soil below and more light once they sprout. It will also stress the old grass a bit, giving the new type a fighting chance to establish itself. Remove thatch if you’ve got a thick layer. For seeds to take root in soil, they must touch it. A thick layer of thatch can be a major obstacle to successful overseeding, so if you’ve got one, you’re going to need to get rid of it. 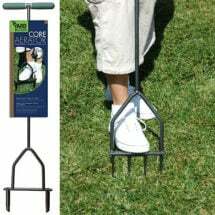 Aerate to improve soil structure and to give seeds a better chance of rooting in soil. Often, a brisk raking will loosen thatch and soil sufficiently. This may be all you need to do after mowing. 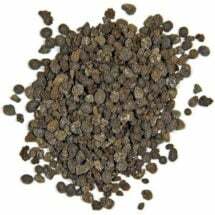 A number of different sources recommend seeding much more thickly (up to one and a-half times as thickly) as recommended for whatever seed you’re using. This is particularly good advice if you’re trying to replace one type of grass with another. 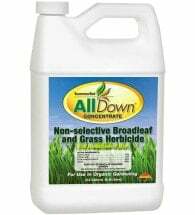 The undesired grass already has a serious head start, and over-seeding (seeding too much) can help to correct that discrepancy. Using a slice-seeder will ensure that seed is deposited into soil at the correct rate. Check out our drought-tolerant mixture that combines several varieties of native grasses with a beautiful selection of annual and perennial wildflowers. Remains green through fall and will grow to a height of 6 to 12 inches — mow once or twice a year, if at all! For best results, topdress by sprinkling compost, topsoil, peat moss or coconut fiber over the newly seeded lawn, then water until the soil surface is dampened everywhere. The soil amendments will give the seeds a boost, and will help retain water over and around the seeds. If you don’t topdress, rake the ground lightly to bring seeds into better contact with soil, then water. Keep the soil surface damp while seeds are germinating and while seedlings are young and new. This probably means twice-daily watering on days without rain. For someone who’s been using a lawn care company, much of what goes above may seem irrelevant. 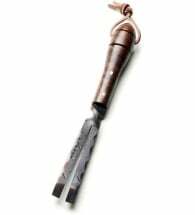 After all, you hire a company precisely because you don’t want to spend a lot of time fussing with your yard, so all this advice about seeding and aerating is beside the point. In any growing number of towns and cities, it’s now possible to hire a natural lawn company that provides either all organic or IPM care. For homeowners where neither of these is available, it may not be possible or practical to switch to completely organic yard care, but it may still be possible to approach an IPM model in which synthetics are used as needed instead of routinely. 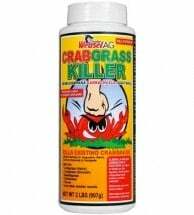 Made from cinnamon bark, AgraLawn® Crabgrass Killer is an all-natural herbicide used as a spot-treatment to control crabgrass, basket grass, chickweed, clover and other similar weeds. Reducing the use of synthetics is always easier if the yard is otherwise well cared for in all the ways described above: deep watering, high mowing, and so on. Anything that is done to improve soil structure will reduce the need for fertilizers and herbicides. Aeration and thatch removal, both of which are fundamental to good lawn care, can both be hired out. Beyond these basics, it’s necessary to get creative, and what suits one person may not suit the next. One option, for instance, would be to invest in a spreader, some corn gluten meal, and several bags of organic compost, and then hire someone to spread them. (Some might go the old-fashioned route and press their children into service.) The spreader is extremely easy to use once it’s set at the correct distribution rate. In early spring, the lawn would be treated with a light layer of compost and corn gluten (see Weed Prevention Plus above), which acts as both fertilizer and pre-emergent herbicide in one. In late spring, another layer of compost could be added. The same process could be repeated in fall. 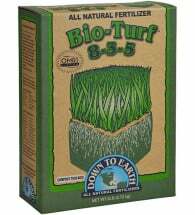 This would do much to fertilize the lawn, improve its soil structure, add organic matter, and keep new weeds at bay. In an otherwise healthy lawn, it would also prevent established weeds from extending their territory. But to actually remove established weeds, it would be necessary to take further action. Another option would be to keep the regular lawn-care company, but on a limited basis. Using herbicides routinely, on a preventative basis, means there’s a fairly good chance that at least some of those potentially harmful chemicals are wasted and will end up in the water supply. Using fertilizer more than once or twice a year means your lawn is probably getting more than it needs or can use, which means that some of that nitrogen is probably ending up in the water supply too. So try cutting back, gradually. It’s a matter of finding what works.